Apple on Tuesday launched a new first-party application in the iOS App Store called "Podcasts," devoted to discovering and downloading Internet content. The free application is now available to download from the App Store. It's an 8.8-megabyte download designed for both iPad and iPhone that requires iOS 5.1 or later. "Podcasts app is the easiest way to discover, subscribe to and play your favorite podcasts on your iPhone, iPad, and iPod touch," Apple's official description reads. "Explore hundreds of thousands of free audio and video podcasts from the Podcasts Catalog, and play the most popular podcasts, organized for you by topic, with the all-new Top Stations feature." In order to optionally sync episodes of podcasts, users must be running iTunes 10.6.3 or later on their Mac or PC. Apple also noted that streaming or downloading episodes requires Internet access over Wi-Fi or a cellular data connection. The launch of the new Podcasts application comes earlier than was rumored, as recent reports indicated that Apple planned to launch a standalone podcast application later this year as part of its iOS 6 operating system update. 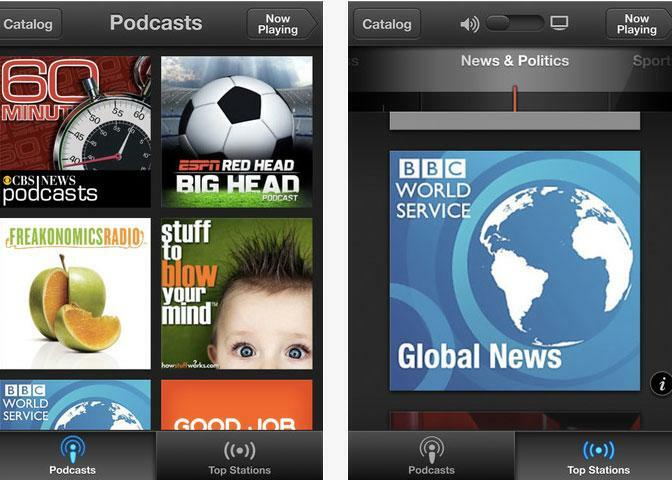 Previously, users were able to explore and download podcasts through the native iOS iTunes application.